As the 67th meeting of the International Whaling Commission (IWC) in Florianópolis, Brazil draws to an end, WWF welcomes efforts to ensure conservation and the protection of the world’s whales and other marine cetaceans prevails. As the 67th meeting of the International Whaling Commission (IWC) in Florianópolis, Brazil draws to an end, Aimée Leslie, WWF’s Global Cetacean bycatch lead, welcomed the commission’s determined efforts to ensure conservation and the protection of the world’s whales and other marine cetaceans prevailed over commercial and unsustainable whaling interests. 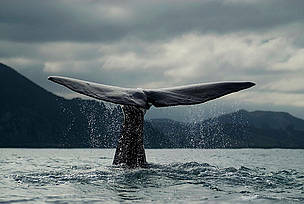 “The IWC has answered the call to ensure we don’t return to the days of unsustainable whaling operations. At a time when the planet’s whale species are under unprecedented threat, we welcome member governments’ decisive vote against commercial whaling and the commission’s dedicated focus on addressing the biggest threat to the world’s cetaceans, global bycatch." To complement these efforts the commission approved a resolution to reduce ghost gear, as well as anthropogenic noise. “As countries start to show a much-needed determination to protect whale species, we hope that the Florioanopolis Declaration outlines a way forward that enables and empowers the IWC to contribute more fully toward the conservation and recovery of whale species worldwide,” added Henry. The IWC also approved the Aboriginal Subsistence Whaling (ASW) quotas of the US, Greenland, Russa, and St. Vincent and the Grenadines. “We are pleased that the communities that depend on whale meat to fulfill nutritional and cultural needs have received the quotas but we hope that the decision for auto-renewal every six years, provided the Scientific Committee ensures sustainability and the quota request does not change, does not undermine the commission’s oversight and authority," closed Leslie.